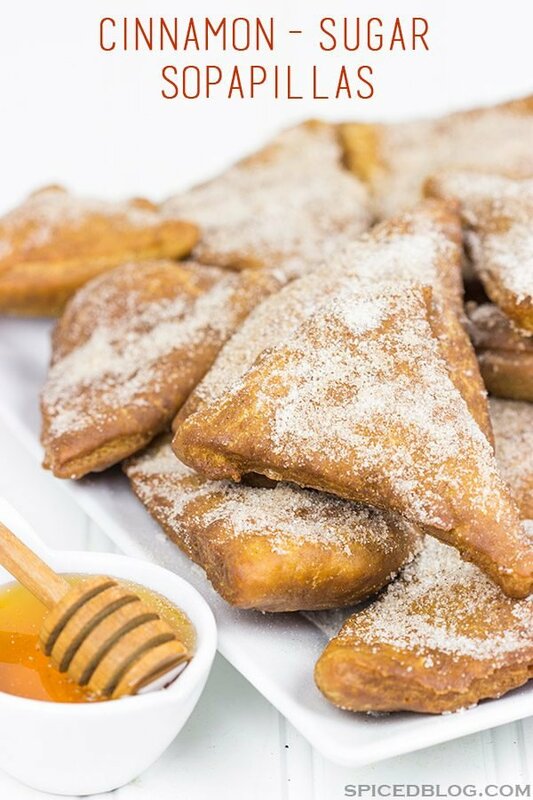 Dusted with cinnamon and sugar and served with honey, these Cinnamon Sugar Sopapillas are the perfect way to end a meal! Ah, doughnuts. How do I love thee? Let me count the ways. Every culture seems to have some variant on this awesome dessert (or breakfast, depending on the day). 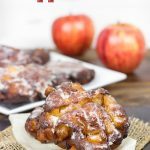 My love for doughnuts is well-documented in both this Baked Powdered Sugar Doughnuts post as well as my ode to the Glazed Apple Fritter. 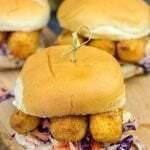 In addition to these American classics, there’s also the French beignet (also famous in New Orleans! 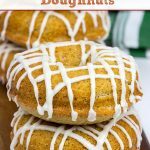 ), the Italian zeppole, the Belgian Dutchie, the Polish paczki and the list goes on… Ultimately, these delicious creations are all some form of fried dough. Sure, the dough recipe varies slightly from culture to culture. And some versions are filled while others are just dusted with sugar. But, in the end, doughnuts are doughnuts…and they’re delicious! The shining star for sopapillas is unquestionably the honey. I’ve seen sopapillas served without honey before, and it’s just a travesty. Serve these bad boys warm with plenty of honey to dip them in. (I prefer dipping rather than drizzling simply to avoid the mess. Call me crazy.) Oh, and roll the dough out as thin as you can. The best way to achieve a nice fluffy sopapilla is to ensure that your dough isn’t too thick. Now excuse me while I go snack on some Cinnamon Sugar Sopapillas for a bit. Honey doesn’t mix well with keyboards. Trust me. 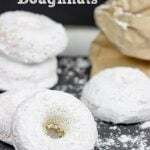 What is your favorite doughnut? Using a large mixing bowl, add the flour, baking soda, sugar, cinnamon and salt. Mix until well combined. Cover dough in plastic wrap and let rest for 20 minutes. 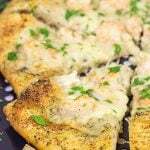 Divide dough into 2 equal pieces. On a well-floured countertop, roll each piece into a 9-10” circle. Cut the dough into 8 triangles, similar to how you would slice a pizza. Allow oil to return to 375°F and repeat process with remaining dough. While the sopapillas are cooling slightly, mix the sugar and cinnamon for the Topping together in a small bowl. Dust the tops of the sopapillas with this Cinnamon Sugar Topping before serving. Serve the sopapillas warm with honey. “…perfect way to end a meal!”??? Wait – why can’t these be THE Meal?? I’m thinking with some beets and Bob’s Red Mill 1 to 1 GF flour, this could be dinner – or maybe even an appetizer? Did you and Mrs. Spiced ever watch “Remember Me” – in which Robert Pattinson and his gal pal always had dessert first? Lil Shashi and I do that every now and then and this would be perfect for those times! Today I learned what sopapillas are (and they look damn fine!) But honestly, I had no idea, and I do eat quite a lot of Mexican food. So thanks for the informative post man! I love sopapillas!!!! These look perfect, David!!! Thanks so much, Alice! I love sopapillas, too…but honestly, any excuse I can find to dip something in honey is pretty darned awesome to me. 🙂 I hope you had a great weekend! Oh David, I know these bad good guys. I made them only twice, in 2012, and I’ve been planning to repeat soon. They have such a unique texure, so different from the other donoughts and so good. And you’re totally right – having them without honey is just nonsense! Good job David and have a lovely Friday! Hi David! I’m with Shashi above. When we go to a restaurant and I know the desserts are really good, I order dessert and eat it first and then maybe have an appetizer. Otherwise, I’m too full to enjoy it! Hi David! Why not? 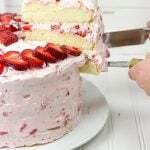 Or, if you feel yourself starting to get full on the main course, stop and eat dessert! 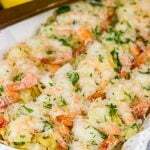 You can always doggie bag the remainder of your meal for tomorrow’s lunch! I would scarf down dinner just to get to these. WOW! oh wow- And you’ve taught me something yet again! 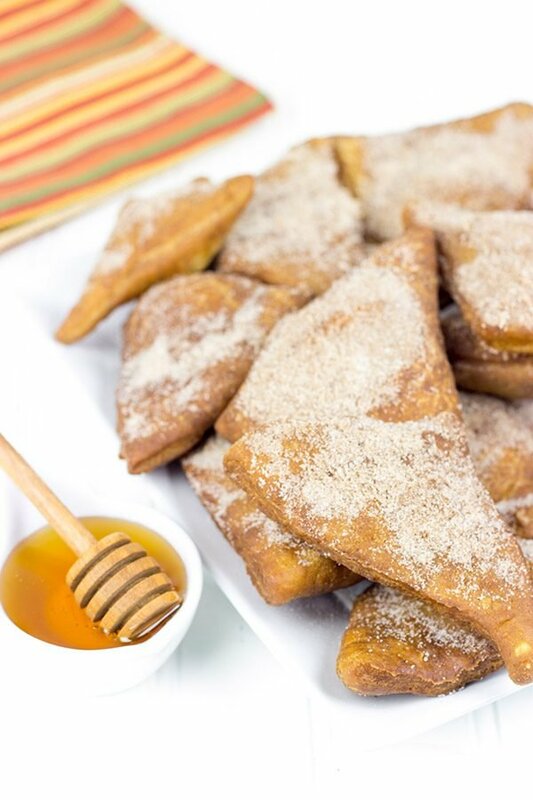 I’ve never heard of these sopapillas but I know I’ll be a fan…Cinnamon sugar AND honey! My favourite donut is actually savoury- It’s like deep fried on the outside and inside has chicken curry- So oily, but so good- There’s also a chicken and mushroom but one but that’s not oily enough…oops. Yes! Sopapillas are amazing, Arman. They’re kinda like Mexican doughnuts…but I guess they aren’t technically doughnuts. Still, they are fried dough covered in cinnamon-sugar and dipped in honey. Sounds pretty much like my heaven right there! Also, I’m intrigued by this thought of a savory doughnut. I’m not sure how my taste buds would respond to that. But I think I need to find out…soon. I hope you had an awesome weekend (and Monday), mate! “Fried dough topped with cinnamon and sugar and dipped in honey.” I’m sold!! I’m sitting here with a cup of tea wishing I had a sweet baked good to go along with it. These look absolutely perfect Dave! I’ll take your doughnut no matter what you want to call it. Except if you stuff it with jelly — I’m with you on that. Jelly doughnuts are sooooo grody. These sopapillas, however, look totally amazing. I’m also impressed at how efficient I can be multitasking while I’m making them! Yes! I was beginning to think I was the only person in the world who doesn’t like jelly-filled doughnuts. Oh, and I don’t like peanut butter and jelly sandwiches, either. Peanut butter alone is fine. And I do like jelly on toast…but keep it pure and unadulterated! Now go be efficient and make some sopapillas this afternoon. 😉 Thanks, Rachelle!! 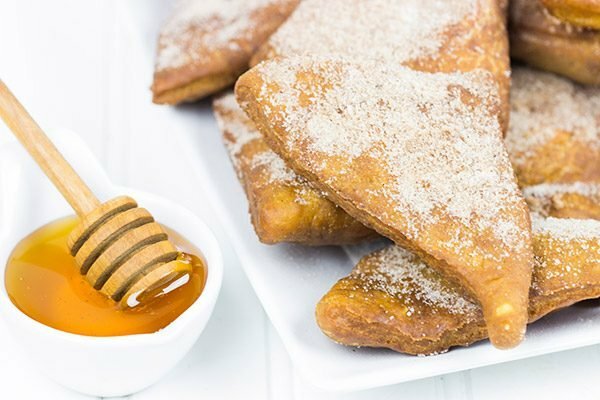 Fried dough dipped in honey AND cinnamon sugar – BRING IT! And I’m with you – jelly doughnuts are no bueno. Thanks, Kevin!! Keep that jelly for toast…not doughnuts. Haha! 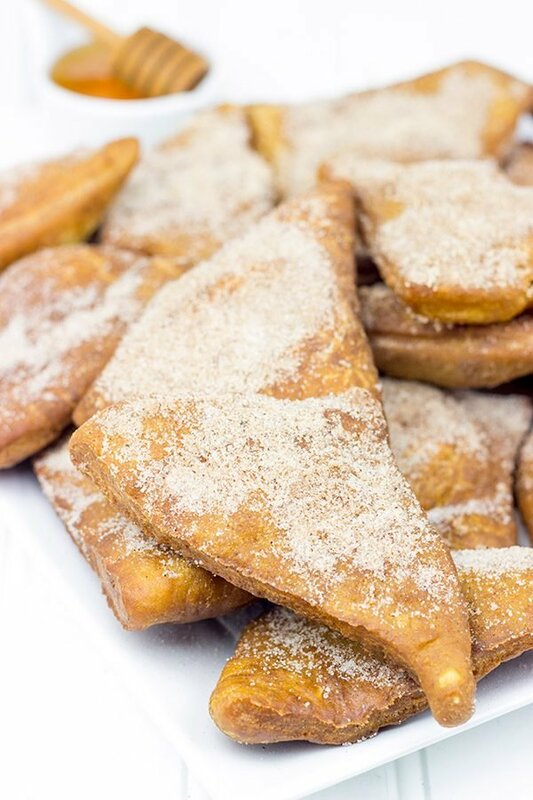 Good morning little pockets of fried dough doused in cinnamon sugar…you are now all I want to eat today! That pb and banana sandwich that I always have for breakfast now sounds completely unappetizing. So….yeah. Thanks for that, David. I agree, jelly filled donuts are not my fav either. When I lived in the San Fran Bay Area, there was this place that made CRAZY donuts – like cookies & cream stuffed donuts with chocolate edible alien figures coming out of it. I never had really been a donut fan but then I got hooked on their insane donuts! How many sopapillas does this make?